Some pictures from our production of “The Apple Tree”. Read more about it in my “Apple Tree” section of my website. It’s a musical comedy. 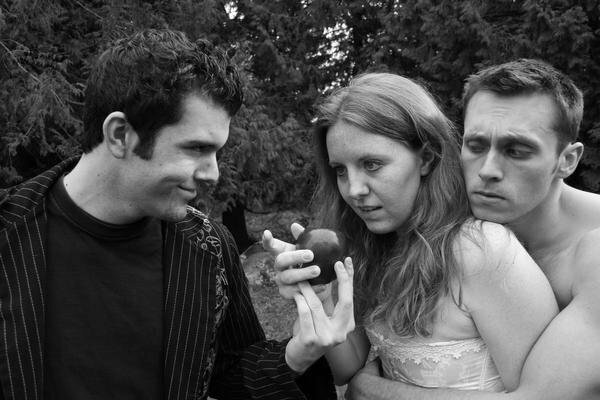 The first act features Adam, Eve and the Snake in a humorous look at the differences between the sexes ala Mark Twain. James Padilla (left – Snake) had the lead role of Curly in Oklahoma and working on the role of Frank ‘N Furter in Rocky Horrow Show. Erin Heminway (middle – Eve) has the lead role in the Bellingham production of Hair. Kevin Pitman (right – Adam) currently studyingÂ under an acting apprenticeship program in….is it Chicago? He’s an incredibly detailed and thorough actor. VERY fun to watch him develop a character to it’s fullest. Mount Vernon, WA – THE APPLE TREE opens April 13th. 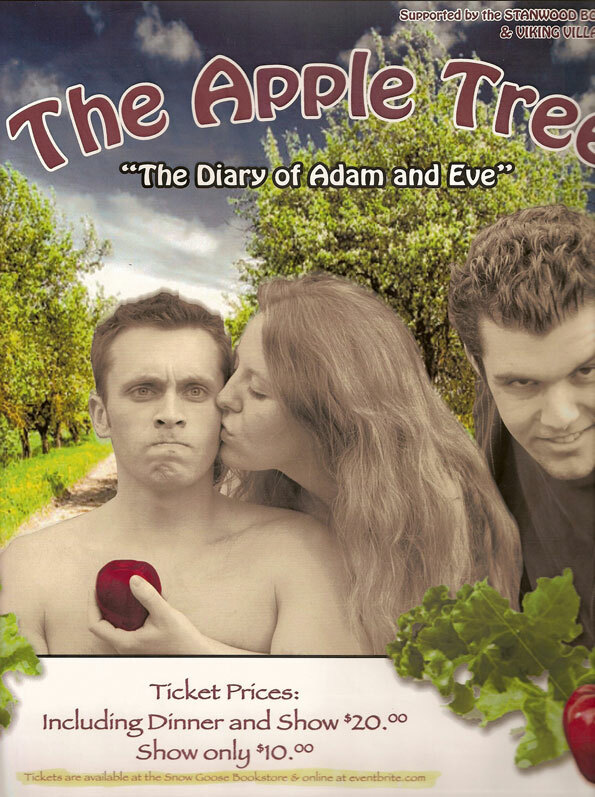 The diary of Adam and Eve “The Apple Tree” is a quirky, touching musical spin on the tale of the world’s first couple, adapted from Mark Twains “Extracts from Adam’s Diary”. This is a three-person show with myself at the piano. Features Adam, Eve and the Snake – all performed hilariously by seasoned actors. It’s a very cute one hour show that highlights some of the historical and stereotypical differences between men and women – who better to explore this with than Adam and Eve. It’s very funny. I’ve never met anyone who did not like the work of Mark Twain – and his dry wit and sense of humour runs throughout this script. I’ve worked with these actors on other productions and they are VERY fun to work with and to watch. This is a musical – lots of great interchanges between Adam and Eve with songs sprinkled throughout. Friday, April 13 2007 – Stanwood High School Theater Performing Arts Center, Stanwood, WA. Dinner and show $20.00 – Show only $10. Dinner at 6pm – show to follow. Catered by Olive Garden of Burlington, WA. Saturday, April 14th 2007 – The Phillip Tarro Theater at Skagit Valley College, Mount Vernon, WA. 6pm dessert and coffee – show to follow. The April 13th performance to benefit the Twin City Idlers Scholarship Fund. The April 14th show to benefit the Drama Department Scholarships of Skagit Valley College. Mount Vernon, WA – Currently working on the first act of The Apple Tree which will run at Stanwood Auditorium (April 13, 2007), Philip Tarro Theater (April 14, 2007) and Mount Vernon Presbyterian Church (April 15, 2007). The first act of the Apple Tree is based on “The Diaries of Adam and Eve” by Mark Twain. It is a comedy that conjuctures the humorous infighting of the first husband and wife, and their interaction with the snake in the Garden of Eden. Music is by Jerry Bock with lyrics by Sheldon Harnick; the same writing team that created Fiddler on the Roof in 1964. 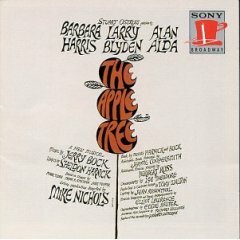 The original run of The Apple Tree musical opened on October 18, 1966 at the Schubert Theater in New York City. It had a very successful first run with 463 performances. The original actors were Barbara Harris, Alan Alda and Larry Blyden. A revival of The Apple Tree is currently running on Broadway in New York by the Roundabout Theatre Company. This musical revival opened in December 2006 and stars Kristin Chenoweth, Brian D’Arcy and Mark Kudisch.